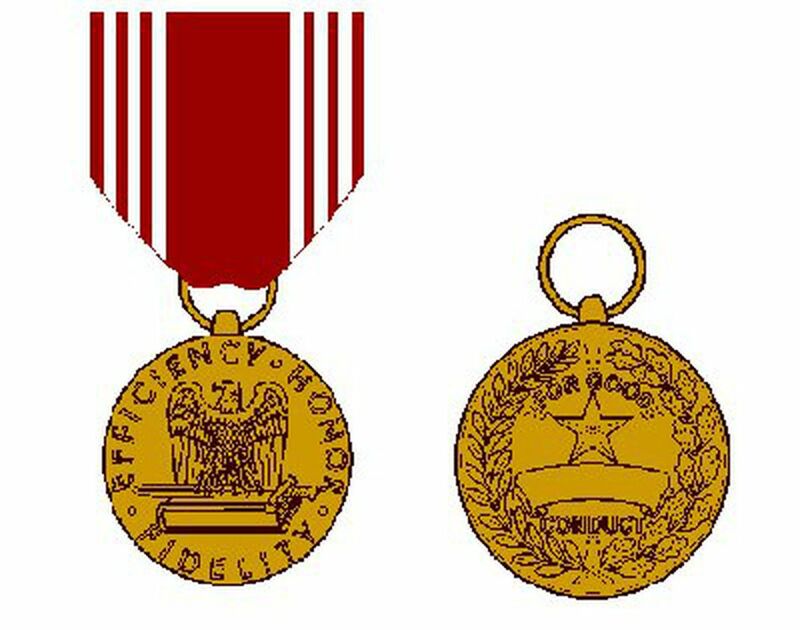 The Army, Navy, Air Force, Marines, and Coast Guard all have their form of the Good Conduct Medal. Established during World War II, the Good Conduct Medal is given to soldiers, marines, sailors, and airmen enlisted who have behaved themselves appropriately and not had any non-judicial punishments, court martials, or other offenses. This behavior must be for three consecutive years. If a member of the military has such an infraction on his/her record, the three year timeline for good behavior restarts. It is possible for members of the military to achieve ten such awards in a 30 year career. The following sections will describe the way to recognize the Good Conduct Medal as well as explain the multiple awards differences. The Good Conduct Medal is a Bronze medal 1 ¼ inches in diameter. It bears an American Bald Eagle standing with wings outspread on a closed book and sword enclosed by the words EFFICIENCY HONOR FIDELITY". On the reverse side, a wreath consisting of a laurel branch on the left side of the medal and an oak branch on the right side enclose a five-pointed star and a scroll between the words "FOR GOOD" and "CONDUCT”. In the case of successive awards, clasps are positioned on the ribbon. The Good Conduct Medal ribbon is 1 3/8 inches and has 13 stripes. The first stripe is 1/16 inch of Soldier Red, followed by 1/16 inch stripe of White, 1/16 inch of Soldier Red; 1/16 inch of White, 1/16 inch of Soldier Red, and 1/16 inch of White. The middle stripe is 5/8 inch of Soldier Red, 1/16 inch of White, 1/16 inch of Soldier Red, 1/16 inch of White, 1/16 inch of Soldier Red, 1/16 inch of White, and the last stripe is1/16 inch of Soldier Red. Good Conduct Medal is awarded on a selective basis to a soldier whom while in active Federal Military duty set himself/herself apart from his/her comrades by exemplary conduct, efficiency, and fidelity throughout a set time of uninterrupted enlisted active Federal military service. Every three years served after 27 August 1940 meets the criteria for a qualifying period of service. For the first award only, if separated before three years, the Good Conduct Medal can be awarded when a minimum of one year is completed, or for one who died in the line of duty before finishing one year of active Federal Military duty. The award must be sanctioned by the immediate commander and must be proclaimed in permanent orders. Active Guard Reserve personnel are eligible for the Good Conduct Medal as of 1 September 1982. The qualification time of Active Guard Reserve may begin at a time during the three years just before 1 September 1982 as long as no part of that time of service was included in a time for which the Army Reserve Components Achievement Medal was awarded. On 28 June 1941, the Good Conduct Medal was sanctioned for soldiers finishing three years active service after 28 June 1941 by Executive Order 8809. Executive Order 9323, dated 31 March 1943, modified the standards for the authorization of the award to three years of service after 7 December 1941, or for one year of service if at war. It was further revised by Executive Order 10444, dated 10 April 1953, to sanction award for three years of service after 27 August 1940 or one year service after 7 December 1941 during a period of time in which the United States is at war and award for the first award for service after 27 June 1950 if service was ended during a period of fewer than three years, but more than one year. Mr. Joseph Kiselewski was the designer of the Good Conduct Medal. The Secretary of War approved the medal design on 30 October 1942. The symbolism of the award includes the eagle with its wings outspread signifying vigilance and superiority. The horizontal sword signifies loyalty, and the book stands for knowledge gained and ability achieved. The lone star on the reverse side represents merit, and the laurel wreath and oak leaves reward and strength. In the case of a second or more awards, a clasp with loop is displayed on the ribbon. For the second through fifth awards, a Bronze clasp with as many loops as awards is displayed. For the sixth (one loop) through tenth awards (5 loops) there is a silver clasp. A gold clasp represents the eleventh (one loop) through the fifteenth award (5 loops).